When a salamander loses a tail, it grows a new one. What’s the difference, biologist Peter Reddien wondered, between a wound that severs a salamander’s tail and one that severs a human spinal cord? Tweaking a gene or injecting a drug to repair damaged or aging organs, muscles, nerves, or brain tissue is one of the most enticing medical scenarios imaginable — a scenario that Reddien, associate professor of biology and Howard Hughes Medical Institute investigator, hopes will one day make the leap from fiction to science. Like salamanders, the ordinary flatworm — a small, mud-colored pond-dweller has the seemingly miraculous ability to regrow “every missing part of its body from tiny fragments of nervous systems, skin, — gut everything,” Reddien says. While the creature’s regenerative ability — it can replace a decapitated head in less than a week and its entire body from a scrap only one-300th of its original size — has captured scientists’ interest for centuries, “there’s no good model using existing knowledge that explains how such dramatic regeneration could work,” Reddien says. The Holy Grail of Reddien’s scientific career is to elucidate such a model. His fascination with the natural world dates to his childhood, when his home was flanked by the interstate and an unlikely pocket of beauty in North Dallas. His back yard bordered a creek in a wooded ravine where he’d wander barefoot, chasing frogs and snakes and keeping an eye out for raccoons, owls, and possums. He’d talk science with his mathematician father and art with his artist mother, and thought he might go into astrophysics. 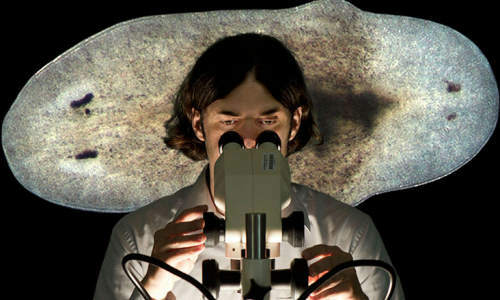 But after graduating from the University of Texas, buoyed by the new tools available for life scientists, he pursued a PhD at MIT in biology and then chose planaria — then not on many scientists’ radar — as a means to investigate regeneration. Key to a flatworm’s regenerative ability is the neoblast, capable of transforming into any cell type in the adult animal. In planaria such as the flatworm, these stem cells have the potential to produce all new tissue — but how do they know what kind of replacements are needed? Just last year, Reddien’s lab made the surprising finding that the genes that “instruct” cells at the wound site whether to start building a new head or a new tail are expressed in the muscle cells of the planarian body wall. “Let’s say you cut off the head,” he says. Position control genes (PCGs) become active in the muscle cells at the wound site, providing a system of body coordinates and positional information that drives neoblasts to build a new head. Reddien believes this “amazing, beautiful system” holds the key to understanding the molecular logic of regeneration. Reddien believes we are in the midst of an explosion of basic biological discovery in which new tools for studying genes shared by the flatworms and humans could boost understanding of stem cells, holding out hope that one day human stem cells could be regulated to replace aged, damaged, and missing tissues. Even humans “last longer than most machines we can build,” he says. “It’s amazing how good the body is at repairing its tissues, muscle, skin, blood vessels, peripheral nerves, bones — but there are limits on how much it can do.” With a boost from the ordinary flatworm, those limits might one day be redefined. The above story is based on materials provided by MIT, Deborah Halber.